Please note that when inputting our address into a GPS, you might need to change the city to Williams, Az in order to be directed to the correct location (if using something other than google maps). From Phoenix: TRAVEL ON I-17 NORTH TO HWY 69 WEST TO 89 NORTH UNTIL YOU GET TO ASH FORK, AZ. (UNDER I-40 INTO TOWN). LOCATE THE MOBLIE GAS STATION ON THE RIGHT AND TAKE THE NEXT POSSIBLE RIGHT TURN ON TO DOUBLE A RANCH RD. GO ACROSS THE RAIL ROAD TRACKS AND TRAVEL 1.5 MILES ON DOUBLE A RANCH RD. AND SPOT THE DRAKE STONE PRODUCTS YARD. CHECK IN ON THE LEFT. LOOK FOR PAT OR MUCIO. From Prescott & 89 North: TRAVEL ON 89 NORTH UNTIL YOU GET TO ASH FORK, AZ. (UNDER I-40 INTO TOWN). LOCATE THE MOBLIE GAS STATION ON THE RIGHT AND TAKE THE NEXT POSSIBLE RIGHT TURN ON TO DOUBLE A RANCH RD. GO ACROSS THE RAIL ROAD TRACKS AND TRAVEL 1.5 MILES ON DOUBLE A RANCH RD. AND SPOT THE DRAKE STONE PRODUCTS YARD. CHECK IN ON THE LEFT. LOOK FOR PAT OR MUCIO. From Flagstaff: TRAVEL WEST ON I-40 TO EXIT 146 AT THE BOTTOM OF THE OFF RAMP TAKE A RIGHT IN TO ASH FORK, AZ. LOCATE THE MOBLIE GAS STATION ON THE RIGHT AND TAKE THE NEXT POSSIBLE RIGHT TURN ON TO DOUBLE A RANCH RD. GO ACROSS THE RAIL ROAD TRACKS AND TRAVEL 1.5 MILES ON DOUBLE A RANCH RD. 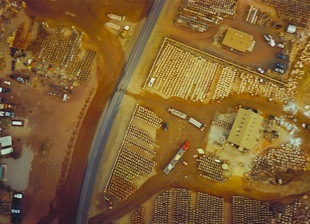 AND SPOT THE DRAKE STONE PRODUCTS YARD. CHECK IN ON THE LEFT. LOOK FOR PAT OR MUCIO. From Kingman: TRAVEL EAST ON I-40 TO EXIT 146 AT THE BOTTOM OF THE OFF RAMP TAKE A LEFT IN TO ASH FORK, AZ. LOCATE THE MOBLIE GAS STATION ON THE RIGHT AND TAKE THE NEXT POSSIBLE RIGHT TURN ON TO DOUBLE A RANCH RD. GO ACROSS THE RAIL ROAD TRACKS AND TRAVEL 1.5 MILES ON DOUBLE A RANCH RD. AND SPOT THE DRAKE STONE PRODUCTS YARD. CHECK IN ON THE LEFT. LOOK FOR PAT OR MUCIO.